Essential information that will help you find the best options for you, avoid scams, and make sure that your expunged records are actually removed from background check reports. 1. Are you a law firm with licensed attorneys? Attorneys are licensed and regulated by the state. Only an attorney can represent you in court, file responses to district attorneys, or give legal advice. Having anyone but an attorney handle your expungement is like having anyone but a dentist fix your teeth. 2. Can you expedite the process of having the expunged record removed from background check companies? It is a fact that expunged record can still show up on commercial background check reports— even up to a year after the record is expunged. Most attorneys do not instruct background check companies to stop reporting your expunged or sealed record (read more about this below). There are hundreds of background check companies: getting your expunged record removed from their systems is often the most important step. See the section below for more information. 3. What is your Better Business Bureau rating and how long have you been a member? Anyone can get an “A” rating for a few months. Make sure that they have had it for at least a year or more. Click here to see a list of recommended expungement attorneys or click here to see if you are eligible for expungement. 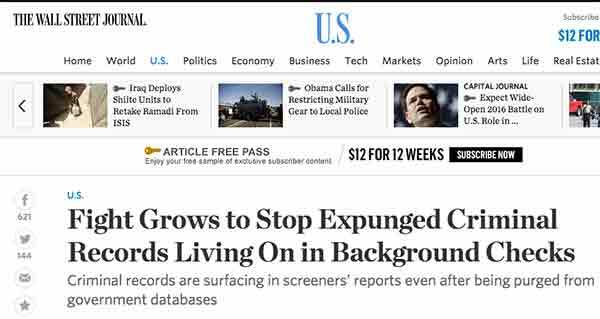 Expunged records appearing on background checks even after the record has been expunged from the court records is a BIG PROBLEM. The Wall Street Journal recently reported about it. Expunging the record at the court is often just part of the battle. 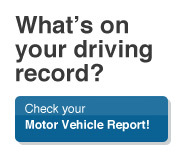 Once your record is expunged, only government databases update that record. The problem is that most employers and landlords use private background check companies which do not immediately update to show that your record has been expunged. Many background check companies only update their records once a year and the courts do not notify the background check companies about expunged cases. So, your expunged or sealed record may remain in a background check company’s system and continue to be reported to employers until the background check company eventually does its periodic update of court records. So, waiting for background check companies to update their records means that you may be left explaining to employers about what happened in your case and trying to explain that it was expunged— which is kind of like trying to un-ring a bell after the the alarm has already sounded. Make sure that you do not have to wait months or longer for your expunged record to be removed from private background check companies by making sure that you work with a law firm who goes beyond just clearing your record at the court, and actually clears it where it matters most, with the background check companies. Ask your attorney if he or she provides this service. Click here to see a list of recommended expungement attorneys who can update background checks. The internet is a great way to find a qualified attorney (click here to see a list of recommended expungement attorneys) who can expunge or seal your criminal record at an affordable price. You can even get free assistance from attorneys online or at the public defender’s office. Beware of scam sites posing as attorneys. They often call themselves “document processors,” “paralegals,” or a “legal service.” Do not allow non-attorneys to take your money, waste your time, access your confidential information, let you become a victim of identity theft, or blow what might be your only chance to clear your criminal record. Tip: If you cannot find a street address on the web site or the only address listed is a PO Box, there is a good chance that it is a scam. If you cannot afford an attorney, seek help from the public defender or legal aid society. 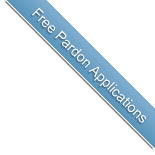 For expungement guides and information, we recommend visiting this page to have your expungement questions answered. Visit our list of recommended expungement attorneys or click here to see if you are eligible for expungement.